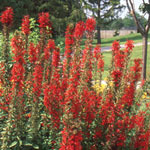 This eastern U.S. native has tall erect stems topped by brilliant spikes of red flowers. Prefers a moist soil. A very cold hardy plant for those northern hummingbirds.